“UFC 152: Jones vs. Belfort” took place Saturday inside Air Canada Centre in Toronto. 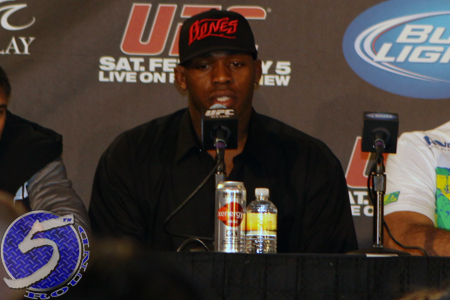 There was plenty off controversy surrounding Jon Jones (Pictured) entering last night’s fight. The reigning light heavyweight king blocked out all the drama and overcame an early scare to submit Vitor Belfort in the night’s featured attraction. Demetrious Johnson defeated Joseph Benavidez to become the promotion’s inaugural flyweight champion in the co-main event. According to UFC president Dana White, 16,8000 fans packed the arena, garnering a live gate of $1,921,000. White said a Anderson Silva vs Bisping fight would be “interesting.” Wouldn’t guarantee anything. White claimed this was Jones’ best performance because he overcame adversity in opening round. White says Jones is “close” to cleaning out light heavyweight division. Still has Dan Henderson. Belfort said he eased up when he heard Jones’ elbow pop. Benavidez’s face was wrecked, while Johnson’s was unscathed. Stann’s mug was thrashed, too. White: Fans who booed flyweight title fight are morons. White scored the bout 4-1 for Johnson. He didn’t think it was close. White RIPPED a Toronto columnist, who wasn’t present, for writing THIS. Jones showed up to the presser late and with his right arm in a sling. Jones admits he needs to embrace jiu jitsu more.